Nokia’s exit from the mobile making market earlier this year, selling its devices division to Microsoft who went on to make swingeing staff cuts in the acquired division, has a silver lining in bolstering the local startup scene, via all this freed up expertise in connected devices. Haltian, a Finnish design services startup, is one such ex-Nokia staff startup. It designs and builds connected hardware for others but is now also taking a crowdfunding route to push a connected developer device of its own to market, with the aim of lowering the barrier of entry to the Internet of Things (IoT). The sensor-stuffed device, called Thingsee One, is designed to democratize the IoT by allowing users to easily configure a particular function, i.e. without needing to be a software programmer or hardware tinkerer to do so. The lozenge-shaped Thingsee One resembles a chunky mobile phone and contains a smorgasbord of radio tech and sensors, including 2G GPRS, Bluetooth, Wi-Fi, GPS, accelerometer, gyroscope, magnetometer, light sensor, pressure sensor — so it can sense when it’s tilted, rolled, accelerated, plus monitor various environmental conditions such as light and dark, whether it’s raining, and more. It’s ruggedized and waterproofed for outdoor use, contains a 1,900 mAh battery and also packs in a monochrome display screen. 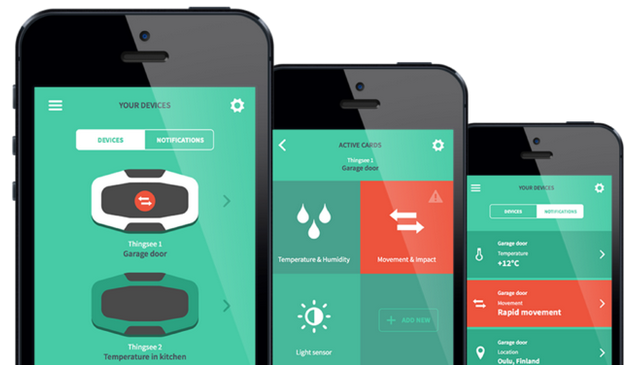 The user is then able to select and configure the particular combination of sensors they need to power their own project using a companion mobile app (Android or iOS). Or that’s the promise. For now Thingsee is a prototype, with Haltian looking for $99,000 on Kickstarter to bulk buy components to ship the gizmo at a $149+ price-point next April. It’s one of several dev kits for IoT being cooked up, although others — such as relayr’s Wunderbar and the health-focused BITalino sensor kit — require more developer chops to be put to work, especially on the software side. Thingsee started life as a shipping tracking project but evolved into a multifunctional connected DIY IoT device mostly as a result of the team’s expertise in connected devices, says co-founder Ville Ylläsjärvi. He says they also spotted an opportunity to lower the barrier of entry to all sorts of connected hardware applications. “When our engineers started talking about other uses for the hardware — everyone seemed to have one,” he adds. The Thingsee One’s Kickstarter page details a few potential applications, such as sending notifications when mail has been delivered to a physical postbox, tracking people and triggering notifications when someone strays outside a geofenced area, along with various hobby scenarios such as mapping and monitoring location or tracking variables like speed and acceleration. Beyond hobbyists and consumer users, Haltian sees a market for Thingsee One to help startups quickly pilot business ideas — without having to get their hands dirty building any hardware for the test phase. The Thingsee OS is based on the NuttX real-time operating system, with a little “added spice”, but the software is also open source so can be flashed with another OS if a developer wishes. Haltian has been funding work on Thingsee through its other business, but as with many Finnish startups it has also had a helping hand from the taxpayer-funded Tekes Finnish Funding Agency For Innovation.